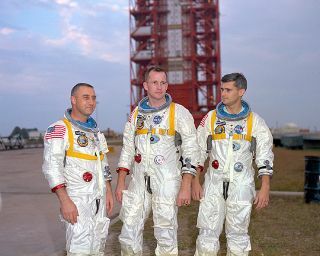 In this space history photo from the U.S. space agency, astronauts (left to right) Gus Grissom, Ed White, and Roger Chaffee, pose in front of Launch Complex 34 which is housing their Saturn 1 launch vehicle in January of 1967. The astronauts later died tragically in a fire on the pad. The training accident prompted a major investigation into the cause of the Apollo 1 fire, resulting in substantial safety improvements for future missions. Two years later, in July 1969, NASA launched the Apollo 11 mission that landed the first astronauts on the moon.